Deposits by Households and Non-Financial Corporations in Germany and France have shown marked growth but this is likely a sign of repatriation of capital from the US as confidence in the Trump administration unwinds. Recent strength in the euro supports this idea. 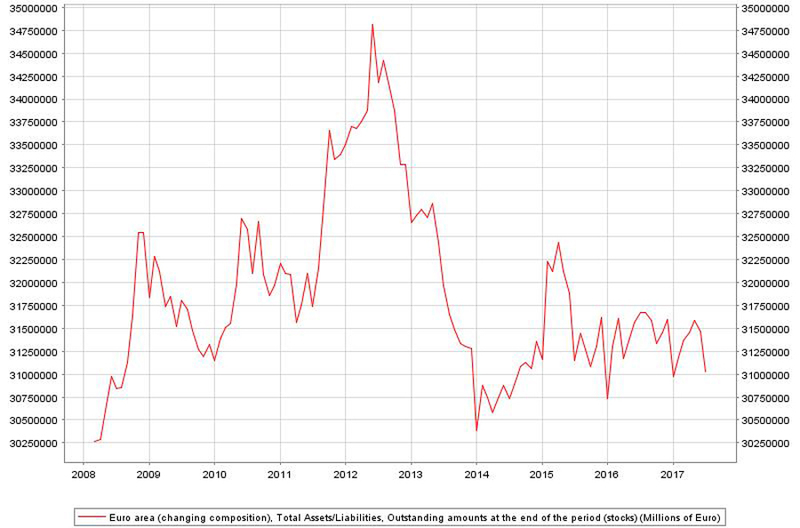 So does a levelling off of growth in US deposits. If these trends don’t reverse soon, they should begin to negatively impact US stock and bond prices, particularly when the Fed begins to shrink its balance sheet as it has promised to do starting later this year. For ECB money printing to continue to prop up US stock prices, European investors must want to send their capital to the US. Throughout modern investment history, all capital roads have led to Wall Street. If European investors lose faith in the US government and the collapsing US dollar, this will no longer be the case…good for Europe but not good for US asset prices. Here’s the data. Total assets in European banks plunged by 1.4% in June after a drop of 0.4% in May. Bank assets in Europe remain in the same range they have been in since December 2014 despite enormous asset purchases by the ECB. Obviously, the money is not staying in the banking system. Bank assets remain down an amazing 10.9% since mid 2012 and down 4.3% from the peak in early 2015. There’s no sign of any outbreak of bank lending, probably because there’s no demand. Here’s the latest data from The Wall Street Examiner. This does not look to me like an economy that is busting out. Some Wall Street analysts are encouraging investors to jump into EU bank stocks. However, the fact is that there remains nearly €1 trillion in bad loans within the European banking system. This represents 6.7% of the EU economy compared with non-performing loans ratios in the US and Japan of 1.7 per cent and 1.6 per cent of GDP, respectively. Stay away. Next Next post: Equities Up Because of Earnings? NO!